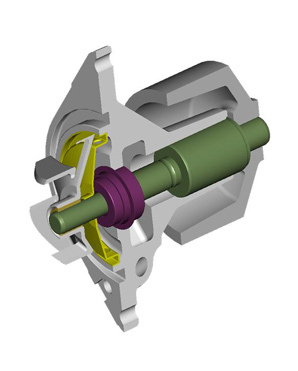 Concentric Pumps Ltd has patented a new design of seal shroud to combat the problem of leaking seals and consequent bearing failure in automotive water pumps, which are a significant and costly source of warranty claims on engine manufacturers. The new Concentric design incorporates a shroud, normally of pressed steel, inserted into the pump housing to form a pressure chamber around the seal. This provides a better, more stable environment for the seal, dramatically reducing silicate formation and consequently the risk of failure. It also reduces the cost of both housing and seal, which together with big warranty savings makes the Concentric design a major advance for OEMs. The unique feature of the Concentric patent is a number of apertures around the periphery of the shroud which allow relatively high pump outlet pressure within the chamber. The space between the shroud and the pump shaft is designed to ensure even distribution of the coolant flow over the seal, while maintaining pressure. The new design is the first to address the problem of localized boiling of the coolant at the sealing faces. Boiling leads to the formation of silicates which can progressively degrade the seal faces, but it can be avoided by raising the pressure around the seal and hence the boiling point of the coolant. At 6000 rpm the Concentric shroud will increase coolant boiling point by around 25ºC. The high pressure achieved by the Concentric shroud also helps to avoid the problem of dry running which can occur when low pressures cause the coolant to vaporize. The resulting high temperature leads to "thermal rotation" or distortion of the primary sealing ring, again encouraging silicates to form an abrasive film on the seal faces. In addition to its technical advantages, the Concentric shroud is suitable for volume manufacturing and will allow the use of a less expensive seal. It can also form the pump location diameter, so reducing the cost of manufacturing the housing and offsetting the on-cost of the shroud itself. Based in Birmingham, UK, Concentric Pumps Ltd is one of three manufacturing plants within the Concentric Group, a major supplier to the world's truck, agricultural and construction equipment industries. The company manufactures oil, water and fuel transfer pumps, as well as integrated front cover assemblies for diesel engines. In addition, it also supplies lubrication pumps for transmissions and reciprocating compressors and fans for engine and other applications.